But all that still hasn’t answered the question – where is the money which was allocated for work on the San Antonio Road? We did some more digging today and that led us to the Ministry of Works in Belmopan. For payment to be made, the work has to be certified by an engineer from the Ministry. 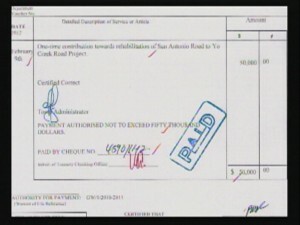 On the vouchers obtained by News Five, the works were certified completed by one G. Medina. News Five managed to contact a very high level source in the Ministry of Works today who agreed to speak on the condition of anonymity. 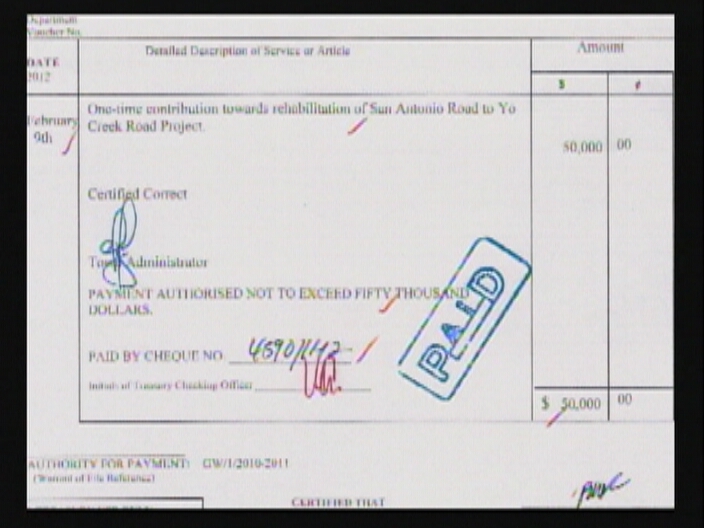 He told us that indeed the works were not done, since the money for the San Antonio Road project was used elsewhere. And when we asked where, we were astounded by the answer. According to the source from the Ministry of Works, the money was used to pay for the paving of Clarke Street in Orange Walk Town. Clarke Street, in case you’re wondering, is where the residence of the Deputy Prime Minister, Gaspar Vega, is located. So is there any good news for the residents on the San Antonio Road? Well no. According to the Ministry of Works, there are no plans to allocate more funds for the fixing of that road in the near future. And this is the next man that they want to run our country. He got away with too much. These people belong in jail right now but they are the government and owns the police so they can get away with anything but their time is coming, the time is coming! But how the people from san antonio road dare compare themselves to the DPM? They no know he special and hardworking and should not have to suffer bad road? They vote for him so they shouldda know they will have to suffer their bad road so he can be comfortable. Inna life you cant havit all – they done get gapi – what more they want? HA HA HA!!! I wonder how this makes our supposedly educated prime minister feel to know that his under educated deputy prime minister makes him look like his little !@#$%. Who is really in charge of the country mr. puppet prime minister? I have a great idea, instead of the criminals rob the poor of their hard earned money why don’t they rob low lives like these; it would be like taking back your own money. THEFT AND BETRAYAL!! Every person whose name appears on the paperwork of this switch needs to be arrested or forced to face the people’s justice. I’m believe Gapi will not escape justice on this Earth, and I know he will be damned when his Judgment comes. This is sad and shameful…..what will be done about it??? Gapi should thank Imer for the gift of his own private street. But Imer still OWES THE PEOPLE OF BELIZE THE STREET HE WAS PAID TO PAVE! Whatever paving Imer did for Gapi is his own deal with his own money, but he owes you and me and every other Belizean to do the paving he got paid taxpayer money to do. TIME TO ARREST IMER AND GRIJALVA, THEY CAN SHARE A CELL AND A PRISON ROMANCE, PERHAPS. Pup, udp, all of them do it. And we dont do nothing to stop them every thing is just blah, blah, blah. Get them out and take them to court. Follow through: MUSA and Barrow and Company, the main cromium. he gave his daugther in law an island in Plasencia. you think da joke. this man really thinks he is above normal belizeans. he needs to be put in check. Bear and Mick, totally agree with you guys.. Public officers like these need to be sent to jail together with the Minister. Some of them like those engineers are on contract, even the Finance Officers and in fear of losing their jobs, they lose their dignity and love for this country, they are all to blame. Set of thieves. best thing to do my fellow Belizeans to turn the Jewel like Libya, see all the scums in gov. should be charge for miss-appropriation of national funds that they thief all during their time in power. That’s why I don’t believe in either blue or red they are the same lets all of us Belizeans get ready for a revolution someday to overturn all corruption in gov.